What should Israel’s policy and priorities be during President Barack Obama’s second term? There will be two key themes: minimize antagonism and cope with the negative consequences of US regional policy. Israel’s government must ensure continued US aid, intelligence-sharing, and other forms of cooperation. Obama will almost certainly maintain these programs. This status quo is protected by support for Israel in Congress and the Defense Department. Whatever verbal friction or temporary tempests taking place – including signs of Obama’s personal dislike for Prime Minister Binyamin Netanyahu – should not change this. Obama must decide whether to put a priority on the Israel-Palestinian “peace process,” meaning pressure on Israel to make concessions while the Palestinian Authority doesn’t keep its commitments and makes no compromises. Obama probably won’t behave this way. His botched attempt at Israel- Palestinian peacemaking during the first term is the only such failure he has ever acknowledged. Obama knows success is unlikely and that neither the PA nor Arab states will help him. There are many more pressing issues for the US. Dramatic changes in Egypt, Tunisia, Libya and Syria, among other places, take center stage. When Obama wants to show the United States isn’t too close to Israel, thinking that will make Muslims like him, he can do so with relatively symbolic, minor measures. At any rate, the Israeli government is quite capable of offering cooperation, making concessions on relatively unimportant issues, stalling for time, and essentially calling the PA’s bluff. It should be added that by creating a far more dangerous regional situation, Obama has made major Israeli concessions on territory unthinkable. In the end, though, nothing will happen on the peace process front. How will Obama handle a regional situation increasingly characterized by revolutionary Islamist movements in power or battling for it? Radical regimes now exist in Egypt, the Gaza Strip, Lebanon, Tunisia and Turkey, though Obama doesn’t see this. Obama is going to be supportive of these governments, excepting Hamas in the Gaza Strip. Even there, Hamas benefits from US help and tolerance for its allied regime in Egypt. Given Obama’s policy, the Islamists are likely to become stronger. Aside from consolidation and increasing confidence for those five governments, the most likely Islamist advance is the seizure of power in Syria. And since these same people are dedicated to Israel’s destruction and often speak openly about committing genocide against Jews generally, a US policy that is simultaneously weak and friendly toward its most fanatical enemies is a huge strategic problem for Israel. During Obama’s second term, Israel is likely to face sporadic attacks from the Gaza Strip against which it will periodically have to retaliate. 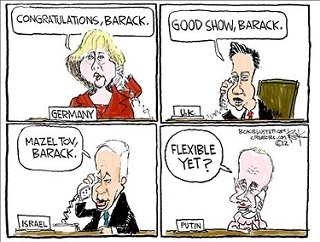 Obama will remain aloof, issuing statements but giving no real support. This isn’t a good situation, but it is a manageable one. The real difficulty would come if Hamas launches an all-out attack on Israel as it did in late 2008. But this time there would be a significant difference. Hamas can expect some level of Egyptian support. That could take many forms: Hamas headquarters, weapon storehouses and other facilities being moved onto Egyptian territory so that Israel cannot touch them; a massive flow of arms, weapons and money across the border financed in part by the ruling Muslim Brotherhood; an influx of Egyptian volunteers to fight alongside Hamas, whose death would lead to howls of revenge in Egypt and other such measures. Beyond this, Egypt could escalate into allowing – it is already doing little to prevent them – cross-border terrorist attacks on Israel. It is conceivable that demands from Salafists and Muslim Brotherhood cadre, the regime’s own revolutionary enthusiasm, the need to distract popular attention from domestic failures, and ideological hysteria, could cause Egypt to end up in a war-like situation or even an open war with Israel. That would be more likely if Israel had to send military forces into the Gaza Strip as happened in 2009. The Egyptian military, the only bulwark against such an adventurous Egyptian policy, has already been tamed by the Muslim Brotherhood regime and Israel cannot depend on the United States to press sufficiently hard for enforcement of the treaty or to deter Egypt. As a result, Israel will have to be ready to fight such a smaller or bigger war by itself. If a Muslim Brotherhood- dominated regime were to be in power in Syria, it could join in. In fact, for the first time in almost 40 years, under Obama, Israel cannot depend on real US support or protection against any Arab threat or aggression. And so Israel, while striving to get Obama to do as much as possible, will just have to take care of itself. It is capable of doing so. Although it is possible to pretend differently, the reality is that Obama will never attack Iranian nuclear installations or support an Israeli attack. This situation, among other factors, makes an Israeli attack on Iran extremely unlikely. That in itself is not necessarily a bad thing. The problem is that Obama will not launch a credible and systematic effort to contain Iran’s aggressive policy, as opposed to putting in place early-warning stations and defensive missiles in the Gulf and making verbal threats of retaliation. Ironically, the solution – aside from Israel’s own defensive efforts – is the very Sunni Islamist power that also threatens Israel. Given the rise of Sunni Islamism and the Syrian civil war, Iran’s influence is going to be largely restricted to Lebanon and, to a lesser extent, Iraq. But what if Israel perceives a credible threat from a nuclear-armed Iran? How much help can it expect from Obama? Of course, he will say the right things. Yet the US judgment on what constitutes a real threat which must be countered even by military force is going to differ sharply from that of Israel. As long as it is just a question of Iran getting nuclear weapons, that disagreement matters less. If it comes to a possibility of Iran using nuclear weapons that gap will be a matter of life and death. So Obama’s reelection is a serious problem for Israel, albeit not a catastrophe or a threat to the state’s existence. For the first time in more than four decades, Israeli leaders – and not just Netanyahu – understand that the country cannot depend on the United States as a protector. The writer is director of the Global Research in International Affairs (GLORIA) Center, Interdisciplinary Center Herzliya, and editor of The Middle East Review of International Affairs (MERIA) journal. His latest books are The Israel-Arab Reader (seventh edition), The Long War for Freedom: The Arab Struggle for Democracy in the Middle East (Wiley), and The Truth About Syria (Palgrave-Macmillan). GLORIA Center is at www.gloriacenter.org.